Upside-down Tigah-now!, originally uploaded by ColleenSwerb. Playing around with Flickr and found this fun option to blog a photo right from my photo stream. Figured I'd give it a shot. I snapped that photo last week and finally got it edited. Can I just say that there's nothing like winter, with it's lack of natural light by the time we get home from work, to remind me how much I love my speed light? Lol! That photo is barely edited. I bumped the contrast a smidge, and added in a bit of black, and that was it! I wish I had gotten her nose in focus instead of her shoulder, but she was NOT cooperating that night so this is the best I could do. More hybrid goodies coming soon too. I've fallen in love with creating hybrid layouts (something I never did before), and I'm excited to show off some examples. I don't know about you guys, but I have a few obsessions in my life. One, is all things paper and stationary (hence the scrapbooking). Ever since I was little I've loved notebooks and pens and pencils. I'm constantly buying new little notebooks, whether it's to alter them, or just to have them. I rarely even write in them, I just like having pretty notebooks around. This has also lead to a LARGE stash of pretty patterned scrapbook paper. Again though, I rarely use it. I'm not confident in my paper pages like I am in my digital pages, so I never want to cut into the pretty papers and "ruin" them. It's a vicious cycle! Thank goodness digital papers have LIMITLESS uses! I can print out 50 sheets now, and another 50 in 10 years if I wanted to! My second obsession is ironically, all things related to organization. Planners, containers, folders, labels, I love them all. The ironic part? I get them, and then fail to implement them! I bought the CUTEST little red polka dot planner last year, and I carried it around with me for about 2 months, and then it just sat on my desk. Worst! I was also keeping half of my schedule in the planner, and half in my phone (a Blackberry at the time), which lead to forgetting things ALL THE TIME. Seriously a useless strategy. My craft area is in our master bedroom, because our master bedroom is massive. I mean it. It's 29'x12'! Long and narrow, which isn't as bad as it sounds. The door to enter the room and the door to the master bathroom kinda divide the room up into 3 areas. The bed is on one end, the recliner/exercise bike/dog bed/dressers are in the middle, and my craft area is on the other end. This works out great because it means I don't take up the small bedroom upstairs as a complete craft room (it's too tiny to serve as my craft room AND a guest bedroom, and we need all the beds we can get when family comes to visit). This works out not so great because I am the world's greatest piler and it drives Jordan insane. Piles here, piles there, craft stuff exploding out of drawers and containers. He hates it. And rightfully so! So last night I went out and bought 3 more of those pretty little white cube organizers from Michael's (on sale! WOOT!). I have this tabletop from Ikea that I LOVE. I try not to keep too much stuff underneath the glass, so I can just scoot projects in there when I need the tabletop (notice I said "try"). I wanted the trestle legs that they show in another configuration, but Ikea was always sold out, so I had to make do with something different. I could still put things on the legs (similar to the trestle), but it wasn't that efficient. Enter the white cubes. I had 6 of them on a different wall underneath a set of shelves, and they worked just fine. But then I saw this desk from Pottery Barn, and it was all over. I LOVE the little cubbies to put things in, and it makes much better use of the space under the table. Except there's no way I could ever buy that desk set (ugh, it's on sale now too, but still, Jordan would never let me spend that much on a DESK). So. The idea entered my head that I could use these cubes from Michael's and make my own little pretend PB set up. So last night I got 3 more (I couldn't decide which 2 I wanted, so I got 3, but it still works). I then came home and dismantled that entire end of the room. Not my brightest idea considering I was supposed to take down the Christmas tree (and then Jordan said he would do it, and then he didn't do it either!). Regardless, I got it set up pretty well last night with a little help from Jordan (that tabletop is HEAVY!). So now I have 4 cubes under each end of the table, and then 2 more on top of 1 end to hold my most used stuffs. 4 of the cubes have shelves in them perfect for storing all (or a LOT) of my papers, 2 have 3 drawers, 2 have 1 drawer and a shelf, and 2 have paper storage and 2 narrow bins each. I will take pictures in a day or two when it's aaaaall finished. Of course, the room is still a disaster area, and I still have to take down the Christmas treee. But it's a start! The new year always leaves me wanting to start everything fresh, and this will be a good start. It will help eliminate the clutter, it will get piles of stuff out from in front of the back windows (which Jordan REALLY hated), and I will have a more efficient space. The thing I don't want to think about? The fact that I will have to move and rearrange everything whenever we decide to put in hardwood floors. Doh. Yea, not thinking about that right now. Just thinking of a wonderfully organized new space! WOOT!! I want to show my husband how deeply I love him, all the time. I want to live boldly and do big things. 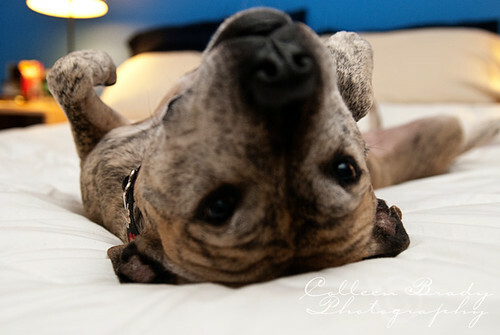 I want to seriously work on my photography skills, and put myself out there to do pet photography sessions. I want to really work on stationary designs for a new website, and grow that aspect of my creativity. I want to continue to grow creatively as a hybrid artist, and a life artist. Professionally, I'll be taking the PE Exam in April (which terrifies me), and taking on more responsibility in the coming year. I hope to grow as an engineer and as a project manager. I hope to solidify my career before we decide to start a family and things get thrown upside-down. 2009 turned into a whirl-wind of a year and just FLEW by. I know that time slows for no man, but I hope to slow things down a bit and learn to enjoy life more fully. Put that project aside and get together with friends. Stop reading that book and enjoy a quiet evening with my husband. Get outside with Tigah-now more, which will benefit both of our health. I hope to enjoy more sunsets and more time spent outside if we get to build our deck this year.